When it comes to planning a wedding, flowers will always be near the front of your thoughts. Whether you focus on the colour scheme for your wedding, setting out the look of the wedding venue or just the accessories that the bride and bridesmaids will have, flowers are a major part of a wedding day. For many people, flowers represent romance and flowers are always indicative of life and vitality. 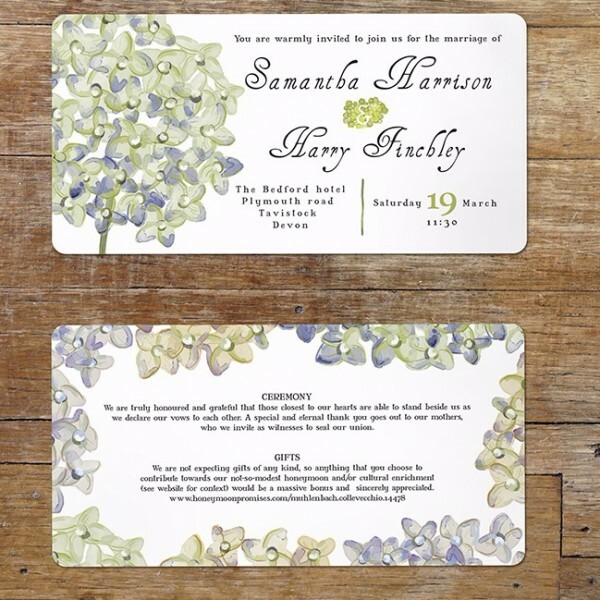 If you are a big believer in the importance of flowers for a wedding day, you will adore the Hydrangea range of wedding invitations by Vintage Designs. This invitation features a watercolour illustration of a hydrangea in full bloom, adding a neat touch of colour and energy to a formal and straightforward card. This is an ideal wedding invitation for spring and summer months, capturing the mood of the season to great effect. This is a delicate style of card but it is printed on a high standard of wedding paper, ensuring that this is an invitation that can be kept as a keepsake of the happy occasion. Whether you are looking to send out invitations with your favourite style of flower or you are keen to find an invitation that is striking enough for people to love and hold on to, you will not be let down by this option. There is a range of additional stationery options available with the hydrangea card, so if you are keen to provide your guests with a range of correspondence or you want to co-ordinate your wedding invitation with menus and table plans, you will find that there is something for everyone. Tags: English Country Garden, Hydrangea, Pretty.